Identification: Fremontodendron 'California Glory' can be distinguished from typical forms of Fremontodendron californicum by the five-lobed leaves. It can be distinguished from Fremontodendron mexicanum by the indumentum of the underside of the leaves, which is mostly white in Fremontodendron 'California Glory', but is brownish in Fremontodendron mexicanum. Shrub, to 5-6 m, stellate-tomentose on most parts; stems initially green, becoming mid-brown in age, densely covered with loose, green, becoming light-brown, stellate hairs; foliage alternate, stipulate and petiolate; stipules erect, somewhat incurved or recurved, subulate, 6-9 mm, both sides with stellate hairs, the abaxial side more so; petioles green, a little shorter than the blades, to 6 cm, with white and russet stellate hairs; laminae leathery, simple, shallowly cordate, ovate, 5-7-palmately nerved, shortly and bluntly, palmately 5-lobed, to 9 cm wide × 8 cm long, lower surface pale green, densely covered with white and brown stellate hairs, the latter principally on the veins, upper surface dark green, dotted with stellate hairs, lobes obtuse or rounded; flowers 8 cm wide, single, oppositifoliate, hermaphrodite, involucellate, apetalous, pedicellate; pedicels stout, green, aging to a reddish-brown, 15 to 25 mm long, covered in stellate hairs; bracteoles 3, lanceolate-subulate, hispid, ciliate, caducous, about 10 mm; sepals 5, connate at the base for about 5 mm, green later reddish-brown in aestivation, petaloid and golden-yellow at anthesis, quincuncial, connate, keeled, saccate (pitted) and nectariferous at base, exterior flushed reddish on spent flowers, keels with a greenish tinge; corolla absent; staminal column golden-yellow, conical, shortly hairy, bearing 5 stamens of the same colour, filaments as long or longer, linear, radiate, shortly hairy, slightly dilated above; anthers borne on the outside of the stamens, dithecate (? ), twisted, septate, polysporangiate, connective minutely prolonged, dehiscing by a longitudinal slit; ovary superior, conical, enclosed by the staminal column, ovules 5-locular, locules pluriovulate; style 12 mm long, yellow, subulate, curved upwards, shorter than the stamens; stigma terminal, a few mm long, darker and duller in colour; fruit a loculicidally dehiscent, 5-valved, acutely ovoid, capsule; seed black, ovate, elaiosome present, testa shining, endosperm fleshy; embyro linear, cotyledons ovate; radicle short. Fremontodendron 'California Glory' is a shrub or small tree growing up to 15 or 20 feet in height, but as it is short-lived may not reach this size. The stems are green, aging to mid-brown, with a dense covering of stellate hairs. The leaves are borne alternately (one per node), subtended by two stipules. The stipules are erect, narrowly triangular, and 4-9 mm in length. Both sides have a covering of stellate hairs; that of the outer side is the denser. The petiole is green, up to 6 cm long, and covered with white and russet stellate hairs. 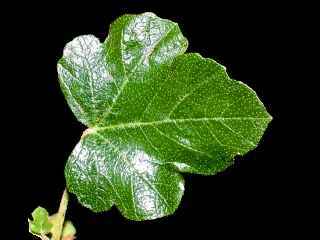 The leathery leaf blades are ovate, cordate at the base, and palmately veined and lobed. The are up to 8 cm long and 9 cm wide. The underside is pale green, and densely covered with white and brown stellate hairs. The later are concentrated along the veins. The upperside is dark green and glossy, dotted with stellate hairs. The apices of the lobes are obtuse-angled or rounded. The main flush of flowers occurs in late spring and early summer, but sparse flowering continues for some months afterwards. The flowers are borne singly, the flower stalks being attached to the stem opposite to the corresponding leaf petiole. The pedicels are green, becoming reddish-brown in age, covered in stellate hairs, and 15 to 25 mm long. 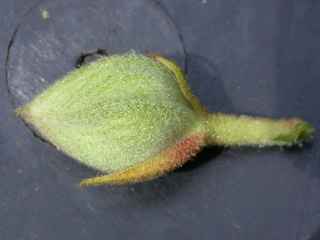 The flower buds are ovoid, with a rounded base and pointed tip. They are imbricate (quincuncial), i.e. with two sepals wholly exposed on the outer surface of the bud, one partly exposed, and two not exposed at all. The buds are indistinctly 5 angled, and on a casual glance the aestivation (bud structure) can be mistaken for the valvate aestivation typically of Malvaceae - the two additional angles are the keeled midribs of the two exterior sepals. The outer surface of the sepals has a covering of stellate hairs. At the base of the bud are three narrowly triangular bracteoles. These often, but not universally, fall off before the flower opens. Both sides of the bracteoles have a covering of stellate hairs; that of the outer side is the denser, and is russet-brown in colour. The mature flower is about 8 cm wide. It is composed of 5, fused, sepals, 5 stamens, arising from a common column, and a single pointed style. The sepals have the same quincuncial arrangement as in bud. They are yellow (RHS 13A). 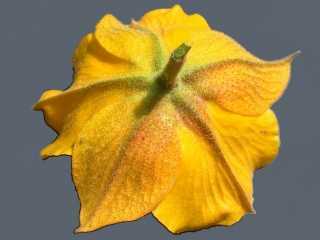 The sepals have a well marked keel, which has a greenish tinge. The outer surface develops a reddish tinge as the flower ages. 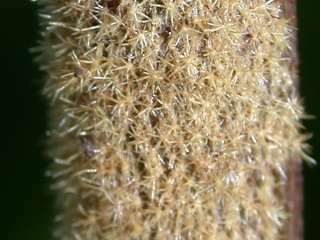 The outer surface is sparsely stellate hairy, especially on the two sepals exposed in bud. When in bud the hairs are white; some darken in flower. The staminal column is much the same colour as the petals. It is about 6 mm long, conical, and bears 5 filaments, each as about 15 mm long. 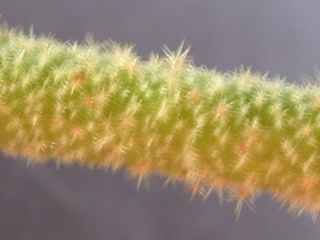 Both the column and the filaments bear short (~0.25 mm) hairs. 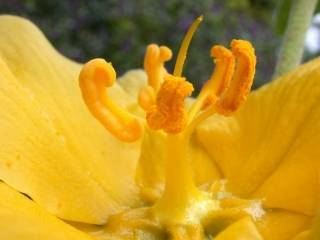 The anthers are a slightly darker and oranger yellow. They are borne on one side of the upper half of the free filaments. The anthers are polysporangiate, the sporangia being curled, and opening by a lengthwise slit. The style is single (some books say five-parted, but my observations are otherwise), relatively slender, and the same colour as the sepals and column, except for the acutely pointed stigmatic region, which is darker and duller. It is about 12 mm long. 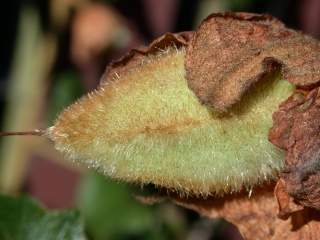 The seed pod is a cylindrical capsule, partially enclosed by the dried remains of the sepals. The seeds are black. 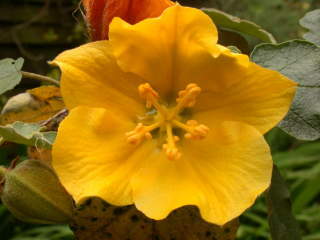 Fremontodendron 'California Glory' is propagated vegetatively, by means of cuttings. Fremontias are hardy only in warm areas, and are generally short-lived. They are, however fast-growing and flower young. They should be grown in well-drained, preferably poorish soil. They are intolerant of shade. Summer watering should be avoided when the plants are established. 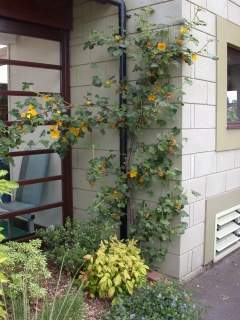 They may be grown as a wall shrub, in which case the branches should be trained flat against the wall. I have found it necessary to manually pollinate flowers to obtain fruit set, and even then did not obtain mature fruit and seeds. However I have also observed developing seed pods on plants in garden centres. As it is a vegetatively propagated clone little variation is expected. However I have seen plants grown under the same name in which the lobes of the leaves are more angular than in the specimen described herein. Fremontodendron 'California Glory' is a garden hybrid between Fremontodendron californicum and Fremontodendron mexicum. To the best of my knowledge no nothospecies name has been published for this cross. Hazards: I have an anecdotal report of respiratory tract irritation from the hairs covering the foliage and fruits of Fremontodendron. They are also known to cause dermatitis and eye irritation, and wearing protection for skin is advised. The hairs of the fruits are sharp enough to penetrate skin, and are likely a worse hazard than the other hairs.